Before Jim Whitewurst became president and CEO of Red Hat, the largest open-source software company in the world with nearly $2 billion in revenues, he held various positions at Delta Airlines. Most recently, he served as COO, responsible for operations, sales and customer service, network and revenue management and corporate strategy. Before that he was a partner at The Boston Consulting Group and held various leadership roles in its Chicago, Hong Kong, Shanghai and Atlanta offices. Not bad for a guy raised in rural Georgia. Before he took the helm at Red Hat, Whitehurst was being wooed primarily by big industrial companies interested in turnarounds. “They were literally sending private planes and taking me to five-star dinners and all that mess,” he recalls. But one day, a recruiter convinced him to fly to Red Hat’s headquarters in Raleigh, North Carolina on a Sunday. He arrived at the building to find it locked and no one in sight. Was this a gag? As Whitehurst pondered going back to the airport, Matthew Szulik, the company’s CEO drove up in his car, rolled down the window and asked, “Want to grab some coffee?” The conversation went well until Szulik went for his wallet to pick-up the tab and realized he didn’t have it. Could Whitehurst spring for the coffee? Next, Szulik asked Whitehurst to meet with Michael Cunningham, the company’s general counsel, at a local Mexican eatery. He did and had another great conversation, after which the restaurant informed them that its credit card machine was broken. Cash-poor, Cunningham turned to Whitehurst and asked him to cover the bill. To make matters worse, Cunningham offered to take Whitehurst to the airport but first had to get gas because his car was “running on fumes.” You guessed it. The gas station didn’t accept credit cards. Whitehurst had to pull out his wallet a third time. He recently set forth these ideas in a book, The Open Organization. Much has been written about “crowdsourcing,” which attempts to harness mass participation to generate big ideas and solve complex problems. The Linux operating system, which played a key role in Red Hat’s start, is an open-source system where communities of people self-organize a problem or activity. The power of open networks has been championed by such gurus as Don Tapscott and innovation evangelist Henry Chesbrough. Companies such as Whole Foods, Pixar, Zappos and Starbucks are said to have implemented open organization precepts. But how does it really work and can it be scaled for most organizations? That’s what we asked Whitehurst when he recently visited New York. It probably spooked you when you joined Red Hat as CEO in 2007, having been an executive at traditional companies such as Delta Airlines and Boston Consulting Group. What did you find? JW: At first it seemed like chaos. I thought, “Oh my God, this place is more of a train wreck than I thought.” There was no order; no structure. How do things get done? I didn’t know the industry either. Then I was out talking to customers and investors and, during that time, the organization made a series of decisions that at Delta would have been made by the executive committee. I went to the team and asked, “Do you guys not trust me?” They replied, “What do you mean?” Soon I began to realize that people here make a number of decisions and there’s more buy-in because they’ve made them. Red Hat was an open organization long before I came on board. I made my mark as a quintessential topdown kind of leader. The company changed me and taught me how to be a better leader. At the same time I’ve put enough structure in place that focuses people’s passion toward specific purposes. Overall, I’ve just gotten more comfortable. Ambiguity is good if you have smart people. Chaos degenerated into anarchy and then civil war to the point where people were resigning in droves. How do you contrast what you describe in your book with this? JW: I hope the book describes that managers play a really important role. The problem is middle managers have gotten a bad rap because middle managers used to be the people who controlled the information flow. What I suspect happened at Zappos was trying to have a leaderless organization without having any managers to direct things. It is a little bit like having a brain that has neurons, but not synapses. the context in which your people can perform well. If you’re saying you don’t have people to help create the context in which people perform well, it seems to me like it’s chaos. Again, maybe I’m wrong, but I think people need a degree of structure and that’s what managers provide. I’m not proposing a new grand theory of management. I’m just saying here’s a structure that works really, really well and has scale. Is what you practice servant leadership? performance happens, I would agree. But I also try to catalyze direction by using what I talk about and the people I put in place and other things to catalyze a general direction. An example would be how we get to be more customer-focused, but still be a technology company. I didn’t go out and say we’re running a project to figure out how we get more customer-focused. I just started talking about it and people started to do things. Think of a coral reef. Plant a stick near the ocean shallows and walk away. Before you know it organic life forms all around it. You write that employee engagement has nothing to do with morale—something you learned at Delta Airlines when it filed for bankruptcy. Explain. The Delta bankruptcy experience taught me that people really want to understand context more than anything. They want to understand the direction of the company and the role they play in it. Most of what we were doing at Delta was negative: cutting pay, laying people off, cutting benefits. I remember going into a meeting to talk about the direction of the company. Everyone’s initial reaction was to try to make people happy or tell them it’s going to be okay. Wrong. A leader’s job is to impart the facts so they know what’s coming and they can make informed decisions for themselves. things and communicating different things than if it’s a morale exercise, which comes off as disingenuous. It generally becomes an HR-led thing versus a CEO-led thing. What is it that you do that your nearest competitor cannot do or do as well? have control. You have to trust that the communities are going to do the right things. Some traditional software companies think open-source is interesting and all that’s required is opening up their code. But if you open up your code, but don’t make it inclusive, people don’t join or you make changes that go upstream. As a result, your engineers get frustrated and start doing their own thing. There are 100 reasons why people aren’t successful doing it. Many traditional software companies start with a brilliant CTO making an educated guess on where the world is going. Our model is completely different. We look outside and see what the most technically sophisticated people are doing. They’re probably doing it in open source because the Googles and Amazons are all doing that. We glom onto those things. We bring a consumable version of what Google or Twitter is doing to the enterprise. We don’t assume that we know where the future of technology is going. We make sure that we’re involved in the right communities to bring the right things. This article originally appeared in the September/October 2015 issue of Chief Executive magazine on page 16. 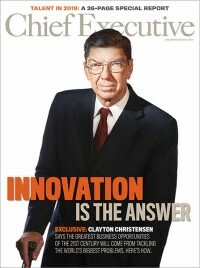 To subscribe to Chief Executive magazine, click here.